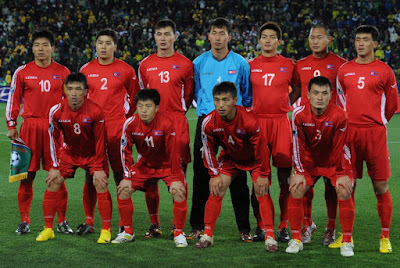 North Korea is a national team who would be considered a second-tier side in Asia along with a whole host of other nations. They often have no issues defeating the minnows but when they come up against the top sides then they tend to come unstuck. That doesn't mean they aren't capable of pulling off surprises against the top sides, but their results against them are inconsistent therefore they only sporadically qualify for major tournaments. North Korea is the side that often takes the one spot in the second round of qualifying in the EAFF (East Asian Football Federation) Championship. The difference in the level of football being played between North Korea and the competition is normally so wide that they can navigate their route to the final every time at a stroll. The competition for North Korea in the second normally comes in the shape of Guam (although Mongolia was in the second round this time), Taiwan and Hong Kong. These sides haven't had the required quality to damage North Korea's chances in the past but that was all about to change this time around. North Korea came unstuck in Taipei against an attack-orientated Hong Kong who is now under the tutelage of Gary White a manager renowned for getting his sides to attack. That attacking impetus was what got Hong Kong over the line in the end and what caused the downfall of North Korea, one more goal scored in the favour of Hong Kong enough to eliminate the North Koreans. North Korea's setup was confusing, they knew they had to take the game to Taiwan in the final game to outscore Hong Kong, but they still played their same slow calculated game, that coupled with a fine performance from Taiwan keeper Pan Wen-chie Saw North Korea go out of the competition for the first time in eight years, when their football team looked to be heading in the correct direction especially as their government are starting to try and get players overseas, even with the difficulties involved in doing that. Does this prove North Korea are stagnating? North Korea seems to be forever stagnating in purgatory like Tottenham, to steal Colin Farrell's famous line from the movie 'In Bruges'. Stuck as one of those second-tier sides in Asia; the bottom sides are no match for them, but the top sides' level is too superior that their inconsistent form against them isn't enough to propel them into being an elite AFC team. There's some way to go before North Korea get to be considered an elite Asian side, but they need to be careful that they also don't stagnate and see themselves being caught up by other nations, which could possibly see them falling behind a host of up-and-coming footballing countries. The difficulty of getting their players playing overseas cannot be helping the progression of their football, and that isn't anything that is going to change for some time. Therefore North Korea could find it difficult to break into the elite, but they have the potential to do so. I know what you’re saying, but I don’t think the Hong Kong draw (which was the main reason for the exit) means they are necessarily failing. I also don’t buy Gary White’s assessment that Hong Kong qualifying over North Korea was that much of a shock. They’ve retreated to type since Kim Yong-Jun took over, even fielding a North Korea of old flat back 5 away in Uzbekistan. The key to their progress under Andersen was their attacking play development. If they could get the likes of Pak Kwang Ryong, Jong Il Gwan, Han Kwang Song & Kim Yu-Song all firing, they could do better in this area. Worryingly, with his initial squad call-ups, I’m doubtful Kim is going to look outside of the domestic league for the Asian Cup. He did look under pressure at the end of the Taiwan game however! Hi Martin, sorry for the very late reply. I do agree that Gary White really bigs up all his achievements the man knows how to self promote himself that's for sure. It is still good what he done getting Hong Kong to the next round, and he will shout it from the rooftop as loudly as he can. As for North Korea most of the time I have seen them I think Andersen would would have been in charge for the majority if not all of it, and they definitely had more of an attacking edge under him. They were not attacking as aggressively as I have seen them in the past and you could have hit the nail on the head, the managerial change could be the key to that. I am eager to try and watch them at the Asian Games but it could be hard to see the games live here as I doubt any TV stations will show them. If Kim only picks domestic based players I think they might struggle.